A football-mad family flew to the UK from China to watch the non-league side their dad "managed" on a computer game. Huang Wenbin became a fan of Runcorn FC Halton, as they were then known, following his tenure in charge of them on Championship Manager 01/02. 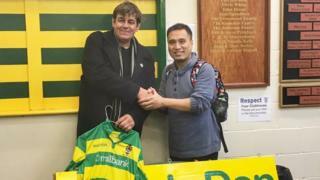 Wenbin, 37, has now completed the ultimate pilgrimage with a 12,000-mile round-trip to visit Runcorn Linnets. The father-of-two said seeing the ground was "the greatest day of my life". Wenbin flew to Liverpool with his wife, Lin Xiaoru, son Yandao, 4, and 11-month-old daughter Geshu, in a bid to find the non-league club. They spent more than 24 hours travelling from Xiamen in China to Liverpool and then spent three hours trying to find the ground. "We all breathed a sigh of relief when we saw that someone was waiting for us in front of the stadium," said Wenbin, who was given the club tour by chairman Mark Buckley. "Mark is such an easygoing person and he introduced the Runcorn Linnets club to us. "He brought us a box of club souvenirs, such as a badge which my son wore on his clothes immediately. "My son wanted to kick the ball on the pitch. Mark was so kind to let him do that and my son enjoyed himself to the full." Mr Buckley told the BBC: "It's a great story. They had a lovely day and they are a lovely family." "We have a Swedish fans group and a Norwegian fans group, but China is certainly the furthest and a bit special," Mr Buckley said. Wenbin, who flew home on Sunday, turned his virtual Runcorn side into world beaters, rising from the Conference to the Premier League, signing the likes of Steven Gerrard, David Beckham, Roy Keane and Ruud van Nistelrooy along the way. The club became the Linnets following the demise of the original club in 2006 and plays in the ninth tier of English football.